Colour matching is so important for make-up. As I’m sure you’ve all seen if you’ve been on the internet in the last few years, if your make-up does not match your face, people notice. People often think that colour matching just relates to their foundation, and usually that is the most important aspect. However, you have to make sure you are colour matching things like your blush as well. Sephora has some awesome technology in their stores. They will take a photo of your face, and a computer will search their database for the best colour match for you out of all the brand they carry. I have had some great experience with this. I used to wear two shades lighter than I needed. I always ended up having to put on a lot of bronzer to even things out, but I felt like I didn’t have another option in a brand I thought worked well with my skin type. Turns out there are way more awesome brand than I knew about. Sephora really saved my life on this one! If you are not interested in using Sephora’s technology, that’s fine, you can do it solo! First, figure out your skins undertone (FYI, this works for all skin tones, from fair to dark) by looking at the colour of your veins. All skin undertone fall into three categories: cool (blue/purple veins), neutral (blue-green veins), or warm (green/olive veins). Honestly, wherever you go, have a beauty expert help you out. Match your make-up in natural light ONLY. This means, when you’re in a store, walk to the window and see the colour better – or put samples on your body and walk outside, then come back. Natural light is your BFF. Test foundation on your neck or jawline (so you’ll want to bring a phone or a mirror outside so you can check out how things look). Ideally you will have a consultant who can match you with what’s best for your skin. 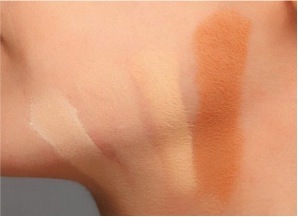 They can then help you match for bronzer if you use it, and the appropriate blush as well. Remember, you want these things to highlight, but not overpower. If you have the opportunity, have your beauty consultant show you their favourite tricks for applying bronzer and blush –just as a refresher!